When something is munching your plants, it can be tricky to find out who's the culprit. And determining the culprit is the first step in remedying the problem. Below are some common Iowa leaf noshers with key elements that will help you identify them. • Slug damage is extremely common in shady, moist places, especially during cool wet weather like this spring. Hostas are a notorious favorite. • Often, at night with a flashlight or in the early morning hours, you can check under the leaves and see the slugs. They're little tiny gray or pale beige soft-bodied slimy blobs, usually a quarter-inch or so long. • Slugs often leave a shiny trail on plant leaves. • On many plants, especially those with larger thick leaves, they make irregular holes with smooth edges. • The holes are usually larger than a pencil eraser and smaller than a quarter. • The damage also tends to be within the leaf blade instead of along the edges. (Most other chewing insects will eat from an edge and take much larger areas.) They usually leave the veins of the plant alone. Severe damage on a hosta will leave the leaves looking like Swiss cheese. • On most plants, they seem to go for the nice, tender new growth. • They usually stay closer to the ground. That's one reason another slug favorite is ripening fruit or veggies that are touching the ground, such as melons, tomatoes, or strawberries. 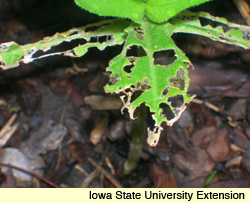 • Slug damage usually happens in Iowa from about late May onward. It's too cold for them earlier than that. • Favorite plants are, by far, hostas. But they like a wide variety of plants, including lettuces. • Click here for more information on slugs and how to control slugs. • Rabbits pick the plant clean, taking the most tender parts. Peppers or tomatoes have entire tops eaten off, with the stems and perhaps some of the tougher parts of the leaves remaining. Click here to see a photo of this. • Rabbits eat all or more of the leaf. They don't leave tiny holes. • Rabbits seldom do much damage to plants in late summer through fall, because they have so many different food sources. • Rabbits often leave droppings in your yard. They look like piles of tiny brown peas. • Favorite plants include newly emerging tulips, pepper plants, green beans. 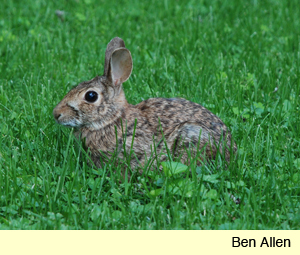 • Click here for tips on controlling rabbits in your garden. • With deer, damage is up higher, up to 6 feet, since they're taller animals. Rabbit damage goes only as high as they can stand, with or without snow, typically under 2 or 3 feet. • Deer are messy eaters. They tear branches and leaves. Rabbits cut things off at nice, sharp angles. 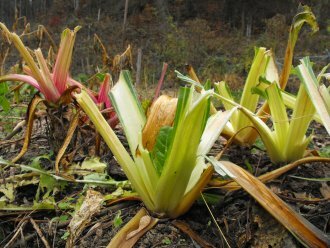 Click here to see a picture of some plants ravaged by deer. • Outside of tall or electric fencing, the best way to deal with deer, if you have a problem with them, is to plant deer-resistant plants. Click here for a list of flowers that deer are less likely to bother. Click here for a list of trees and shrubs. Here's how you can tell that sawflies are the problem. They've been a real issue this spring! • Sawflies are related to wasps. There are many different types of sawflies, but all lay eggs on plants and their larvae eat plant leaves. • A key element to identifying them is that they don’t chew all the way through. They make holes that still have some of the plant tissue intact, so the damage merely looks transparent. Eventually the damaged tissue will break down and fall away leaving a hole. Click here for a picture of a leaf damaged by sawflies. • Insecticidal soap and horticultural oil are both good ways to deal with sawflies. 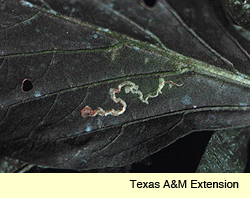 • Leafminer damage is easy to identify because they make twisting, turning marks on the leaves. • The damage doesn't usually don't show up until later spring. • Columbine, mums, and tomatoes are a major favorite. • A variety of insects can make lots of tiny, pin-prick like holes in the plant. Click here to find out more.